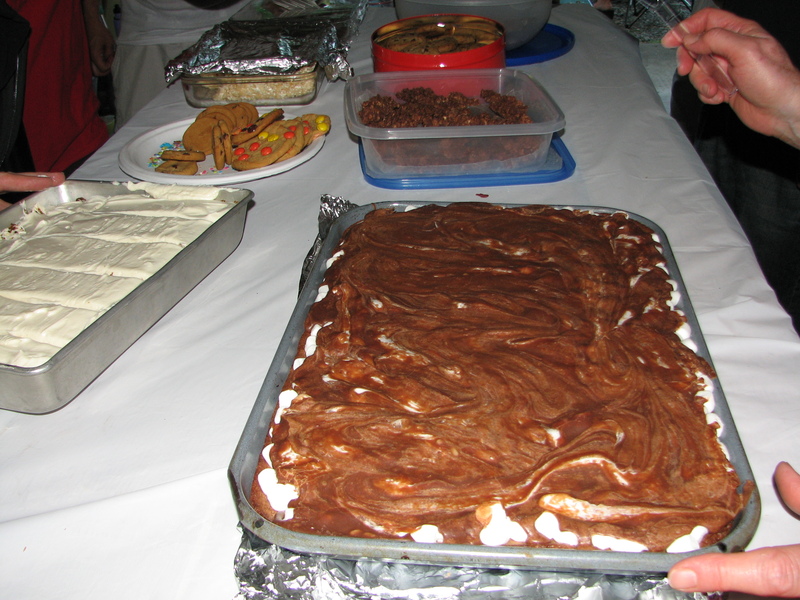 Melt 2 sticks margarine and 2 oz unsweetened chocolate, (1 sq/oz = 6 T Hershey’s Cocoa Powder), in a double boiler. In a large bowl beat 4 eggs and add 2 cups sugar. In a small bowl sift 1½ cups flour and 1 heaping teaspoon of baking powder and 1 teaspoon salt. Mix into egg mixture. Add melted chocolate/margarine and 1 teaspoon vanilla to mixed egg and flour. Spread batter into 11 x 15 pan sprayed with PAM. I use a broiler pan. Bake 350 for 30 min or when toothpick comes out clean. If you use a broiler pan, it may take only 25 minutes to cook. 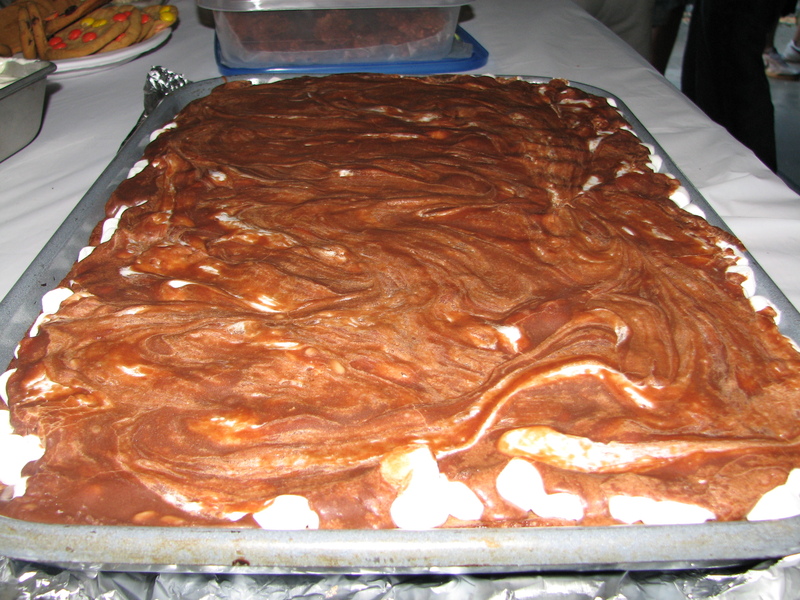 Icing: Melt 1 stick margarine, 2 oz unsweetened chocolate, 2/3 c evaporated milk and 1 c sugar in the double boiler. Stir occasionally while brownies bake. When brownies are done baking, remove from oven and pour 2/3 to 1 bag of mini marshmallow over top of brownies. Add 1 box powdered sugar to the choc icing and continue to stir and cook over double boiler until all the powdered sugar has been melted and the icing is smooth. Remove upper pan from double boiler, dry off bottom so it does not drip onto brownies and pour icing over top of marshmallows. Let cool. Cover and let stand overnight to set icing. Freezes well. If you don’t have the unsweetened choc squares, you can use Hershey’s Cocoa Powder instead of the squares. QUESTION: Can you somehow ALTER this recipe and make it healthier (yet still a good dessert)? Drain/rinse the beans & after rinsing, place back in can. Fill the bean can with water, dump water/beans in a blender and blend for up to 1 minute. Make sure the mixture is well blended and mix with dry brownie mix in a mixing bowl. Mix well, as usual. Do not put in any eggs, oil or extra water besides the water mentioned before. Bake as directed on the box, and make sure to let them cool. I have tried this about 5 times, and each time, people can NEVER tell that they’re not normal, full fat brownies. They give you an extra boost of fiber and protein. Try it, I know you’ll like it! WOW! I have never heard of black beans….That is so interesting. I will have to try that! Every time I open your blog page your pictures jump out at me. I had to comment today because those brownies sound sooo good. I don’t normally healthify dessert recipes so I have no tips. I guess its a good thing I don’t bake a ton, huh? Here is a recipe that will give you some ideas – vegan dbl chocolate brownies.